Rent villas and apartments in Mutxamel, Spain with private pools. This spacious home with its breathtaking panoramic views over Alicante, San Juan till El Campello, with its serene long sandy beaches, forms a unique sea of ​​lights in the evening. This 3 bedroom villa with private pool is located in Bonalba Golf Resort and sleeps 6 people. It has WiFi, air conditioning and a garden. The villa is near a beach. This 3 bedroom villa with private pool is located in Bonalba Golf Resort and sleeps 6 people. It has WiFi, air conditioning and garage. The villa is near a beach. 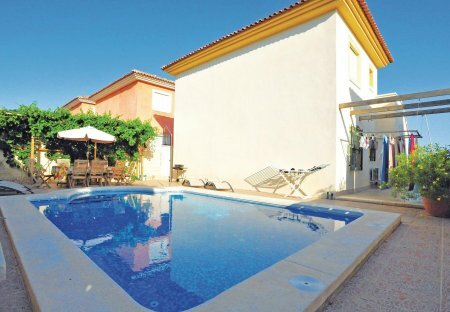 This 3 bedroom villa with swimming pool is located in Bonalba Golf Resort and sleeps 6 people. It has WiFi, air conditioning and parking nearby. The villa is near a beach. This 3-bedroom villa for up to 6 guests is located in Muchamiel and has a private swimming pool. 2 bedroom, 2 bathroom apartment, sleeps 6 with pool on Bonalba Golf, 2kms from beach at El Campello, Alicante for rent. A fabulous luxury 5 bedroom, 3 bathroom front line golf detached villa situated on Bonalba Golf Course with large private garden and pool.